The aim of Saint Peter’s music ministry is to draw us close to God through the special power of music to open our hearts to God’s presence. Our worship services always include song and instrumental music carefully chosen to complement the liturgical season and lectionary readings for the day. The Saint Peter’s choir sings a broad repertoire ranging from Renaissance polyphony to contemporary compositions. Special choral and instrumental music is performed on Holy Days and during the seasons of Lent and Advent, such as the Lessons & Carols service of the Christmas season. Anyone who loves to sing is welcome to join the choir. For more information, contact our Minister of Music, Paul Keene, at music@saintpeterscambridge.org. Rehearsals are Thursdays from 6:45-8:00 pm. While not obligatory, attendance is encouraged because the prep work accomplished at rehearsal enables the Sunday singing experience to be more prayerful and worshipful for the choir. The choir warms up on Sundays at 8:45 am with a break at 10:00 to recollect ourselves and prepare for worship. Paul received his Bachelor’s in Music (Vocal Performance) from Christopher Newport University, where he conducted and cultivated the ΦMA Omicron Nu Men’s Chorus for three years. He received his M.M. in Early Music Performance from the Longy School of Music of Bard College. Paul maintains a voice studio out of Saint Peter’s, and he frequently composes for Saint Peter’s choir. Paul is a member and frequent soloist with Jennifer Lester’s Seraphim Singers and the all-male Beneficia Lucis under James Busby. 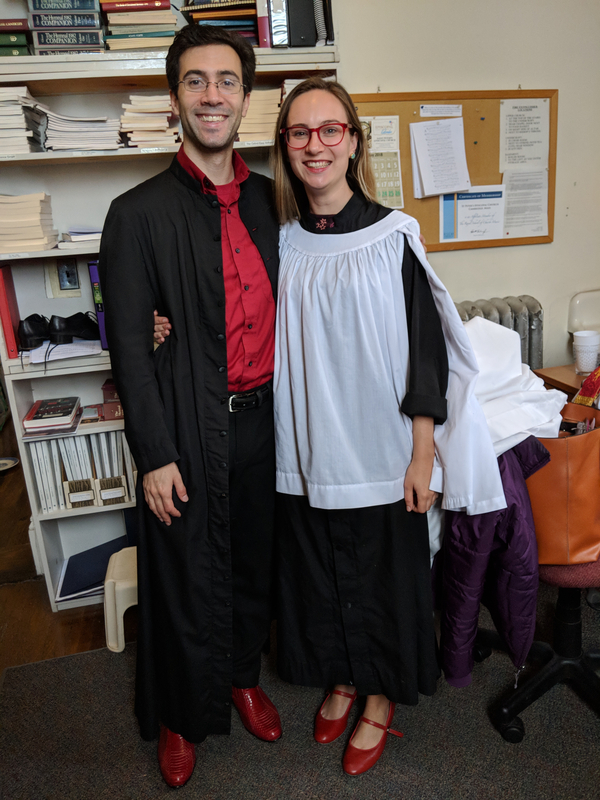 Marissa Hall earned her Bachelor’s Degree in Sacred Music from Florida State University and is currently pursuing a Master’s Degree in Sacred Music at Boston University. She has studied organ with Michael Corzine and Iain Quinn and currently studies with Peter Sykes. Marissa is passionate about church music and worked throughout her education, teaching children’s choirs, overseeing publicity for a large music program, and working with the board of the Royal School of Church Music in America (RSCMA). She loves working with children and has recently begun a music program at Saint Peters’ after-school program, Afterworks. Marissa also serves as music administrator at Trinity Church in Copley Square.